Using amusement to help kids do extraordinary things! Give your child the foundation they need for future academic success, while eliminating fighting and frustration! Simply the world's most engaging math practice tool for students grades 1- 8, including struggling learners. Motivated by their own disillusionment with boring, repetitive, unimaginative math practice apps, Poly sought to build an app that provides AMUSEMENT first and math practice as a successful bi-product of the user's engagement. The result is an addicting, highly visual GAME that harnesses gaming FUN to entertain the learner, while they also happen to be learning and practicing math facts. * You get 4 games in one! * There are NO ads! * Upgrades - Updates - Expansion Content - ALL FREE! * 24 hour response support - FREE! "I have bought many math apps to help my kids become automatic with math facts, but they have all been tedious skill and drill apps that I have had to battle my kids to "play". This App (Star Force Heroes) offers my kids practice that they will love. My daughter now easily asks for math practice daily. Thank you for making my life easier as a parent. Well worth the investment!" 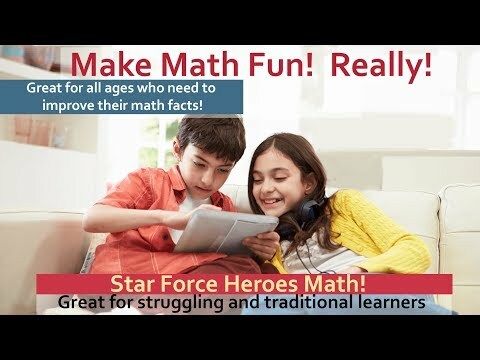 "The only math app that I enjoy playing"
Giving kids who are now accustomed to a high level of gaming performance in today's mobile market, a math game that keeps them engaged is a challenge. Decreasing frustration, maintaining interest, having fun and creating a sense of accomplishment is the goal of Star Force Heroes. Intuition and research argue that the longer you can happily engage a child in the process of learning, the more automatic they will become. Students loose almost half a grade of math ability over summer breaks (Duke University Research). Playing Star Force Heroes will fight this loss and develops immediate recall with math facts. It's perfect for any grade! The learner collects numbers (completes arithmetic) which enables features such as cannonballs, resources or moves. These features are then used in game play to gain experience points for the four Star Force Heroes that are trying to stop General Null and his Robots from taking over the galaxy. The heroes each have special abilities that help in the fight, so all four need to be leveled up to effectively battle General Null. * Base Defense - coming soon for free! * Battle Mode - Math free zone as a reward! The user can focus on one particular game they like most or play all three for variety. The heroes gain experience in all the games and the user's analytics are compiled across all of the games. The artificial intelligence allows the user to play at their own pace. The games adapt to struggling new learners as well as meeting the challenge of advanced students and adults. Questions, Comments or Feedback- Let us know!